It’s a bit frame-like and a lot like a circle medallion image. Believe it or not, it was actually part of the design on the cover of a vintage timepiece from a book all about them by James W. Benson from 1875. 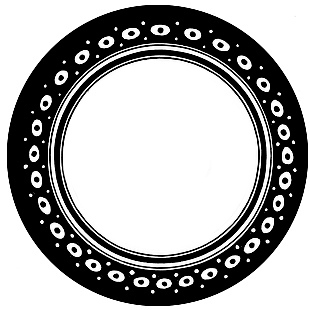 A vintage book talking about a vintage watch provides us with this circle upon circle upon circle medallion image. It’s a bit rustic and isn’t totally edited to today’s standards. But, I think you could easily duplicate the design, fix up this one a bit more or leave it in its current form. Hopefully, you’ll find a great new use for it regardless.